I originally created this site mostly so I could show my out-of-state friends and family what our "new" 911 looks like (in 1997). Since then I've added a few Porsche stories of my own and become involved in the creation and operations of the RennList (formerly PorscheList) mailing lists. I have also implemented an online Porsche option decoder. I hope you enjoy the ride! This handy application will tell you what options your classic Porsche has. 20MB of messages from when PorscheFans and PorchePhiles were the message boards everyone used. 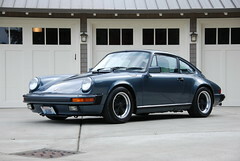 A hugely popular online forum for sorting out techincal issues with classic Porsches. I'm "x038F" up there. Another great online forum for Porsche enthusiasts. I used to own on eof these rare and special cars. I made a web site to document them.